Comm Eye Health Vol. 31 No. 101 2018 pp S16 - S19. Published online 17 July 2018. Community health workers can play an important role in health education and antenatal care that will help reduce the number of preterm births. As members of their communities, they are best placed to advise and support parents and extended families in reducing the risk of ROP and visual loss. Commonly known as ANM, they are a village level female health worker who is the first contact person between community and health services. ANMs are regarded as the grassroots workers in health organisation pyramid. Anganwadi centres are government run mother and child care centres in villages in India. The anganwadi workers ensure antenatal and postnatal care for pregnant women, nursing mothers and immediate diagnosis and care for newborn children. Monitoring regular health and medical check-ups for women and children is one of their key responsibilities. ASHA workers are local women trained to act as health educators and promoters in their communities. Their tasks include motivating women to give birth in hospitals, bringing children to immunisation clinics, encouraging family planning, treating basic illness and injury with first aid, keeping demographic records and improving sanitation. Child marriage has lasting consequences on girls, from their health, education and social development perspectives which often last well beyond adolescence. It has been found that teenage mothers are three times more likely to deliver preterm babies and twice as likely to deliver low birth weight (LBW) babies compared to older mothers (21 Yrs to 34 Yrs).4 Health workers, especially in rural areas can counsel newly weds and public about such age-old harmful practices. It is likely that when the space between births is short, there will be depleted nutrition in new mothers, as these women do not get enough time to recover before getting pregnant again. Therefore, after a birth, the interval before attempting a new pregnancy should be at least 24 months to reduce the risk of adverse maternal and infant outcomes.5 Community health workers can explain that optimally spaced births reduce the infant and maternal morbidity and mortality. They can help in educating their communities about different family planning methods and encourage their use for optimal birth spacing. Maternal undernutrition is still a major problem in India. In populations with food insecurity and high rates of maternal undernutrition, balanced protein energy supplementation may improve foetal growth and reduce the risk of foetal and neonatal death.6 Community health workers can monitor and advise on proper dietary intake of balanced energy and protein contents. As anaemia is more common in rural women, iron supplements may be provided to them. 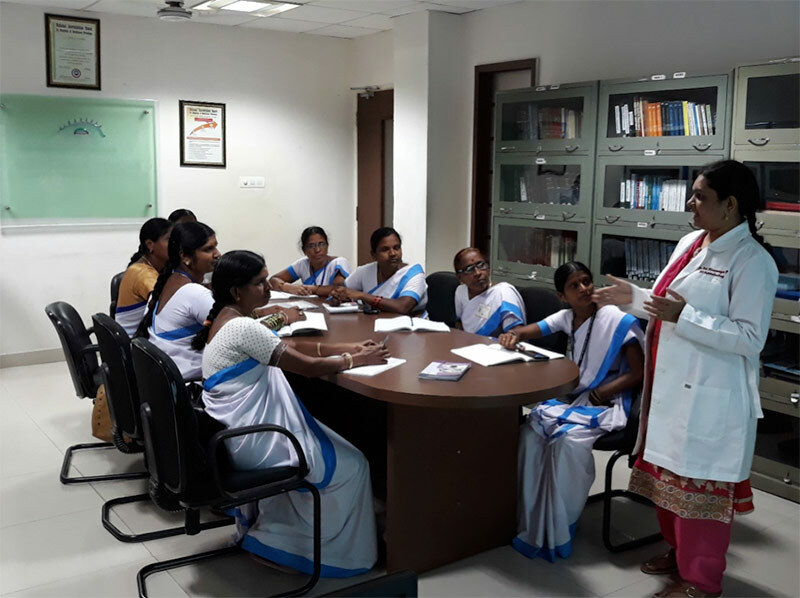 The health workers may provide periconceptual folic acid supplements which help in reducing neural tube defects, preterm births and low birth weight. As village health workers are trusted by friendly pregnant women, they can monitor and guide them about their diet and nutritional supplements from time to time. Prenatal maternal stress, depression and anxiety are found to be related to preterm labour.7,8 A community health worker can explain to the spouse of the pregnant woman and their family members about the ill effects of domestic violence on the outcome of pregnancy. ASHA workers can help in educating pregnant women about regular antenatal check-ups and the importance of periodic follow-up. This aids in monitoring for hypertension, diabetes, infections etc, which if properly managed may reduce preterm deliveries. The community health workers play a role in birth preparedness which consists of preparing the mother, family and community for delivery and potential complications. They should encourage and increase the percentage of hospital deliveries which are safe for the mother and child. With a preterm birth, the focus shifts to prevention of ROP and other morbidities. A well- trained health worker anticipates and prepares to minimise the morbidities that may ensue. Risk factors like poor weight gain, infection etc if tackled properly can prevent ROP related childhood blindness. A significant reduction in the risks of mortality, respiratory distress syndrome and intraventricular haemorrhage have been confirmed after administering antenatal steroids in babies delivered before before 34 weeks gestation.9 ANMs who are skilled birth assistants should be guided on giving ANC to pregnant women in preterm labour. Guidelines include diagnosis of preterm labour, indications, contraindications and doses of ANC. Thus, the health workers help in prevention of ROP by giving prereferral dose of steroid and arrange for referral to an appropriate facility. It has been found that exclusive breastfeeding for six months starting within an hour after birth may prevent ROP. Health workers can help in explaining to mothers the importance and advantages of exclusive breast feeding. There are several significant short term and long term benefits of breastfeeding preterm infants. Neurodevelopmental outcomes are also proven to improve with early and exclusive breastfeeding.10 The health worker can also be trained to check for proper weight gain. As sepsis in preterm infants leads to increased risk of ROP, infection control procedures like personal hygiene can be clearly explained to mothers. Small yet significant measures such as bathing regularly and washing all clothes used for the baby can be easily explained to the mothers in the local language. Educating family members along with the mother on washing hands thoroughly before touching the baby and keeping surroundings clean help in keeping infections under control. Hypothermia is another concern in the management of pre-term infants. Kangaroo mother care (KMC) involves direct and continuous skin to skin contact between infant and mother. It helps in preventing hypothermia, improving weight gain and reducing incidence of infection. The procedure and benefits of KMC when explained clearly to the mothers, help in improving survival and decrease ROP. Along with KMC, the ASHA workers can also show proper swaddling of babies and keeping babies warm. Community health workers should be made aware that all the babies born too soon (<34 weeks) and small (<2000grams) who have been admitted to SNCU/NICU should undergo first eye screening for ROP before 30 days of birth. 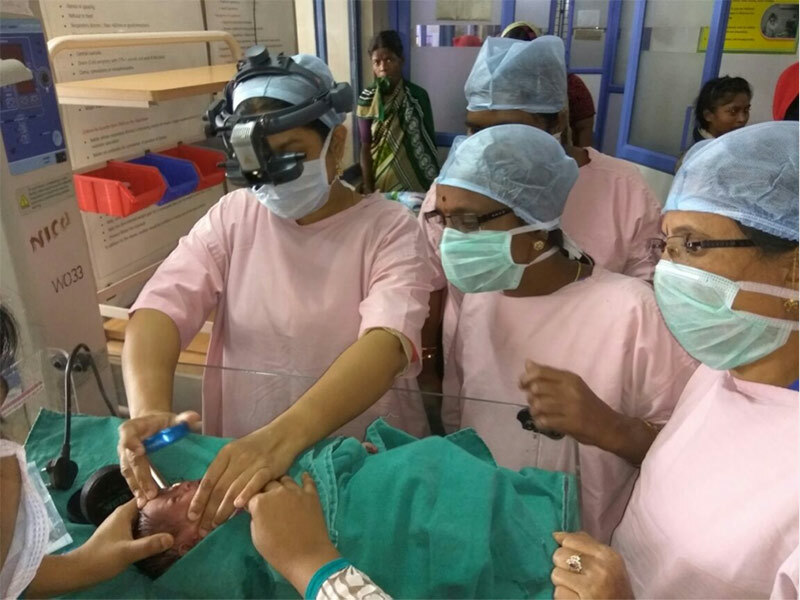 They are best placed to motivate parents to take their preterm infant for ROP eye screening to a trained ophthalmologist nearest to them. Educating parents about the disease with the help of visual aids like flash cards or posters of the disease and how it leads to blindness helps in reaching out to illiterate population in a better way. Health workers can also encourage parents to take the baby for ROP screening before they are 30 days old. Community health workers can help parents understand that ROP is a disease with a narrow time period between detection and treatment and that treatment cannot be delayed. Counselling parents and their families about laser photocoagulation can also be done by a community health worker. The most common challenge faced in management of ROP is lack of compliance and follow-up. Though the initial screening is done when the baby is in NICU, parents especially in rural areas do not come back for follow-up. 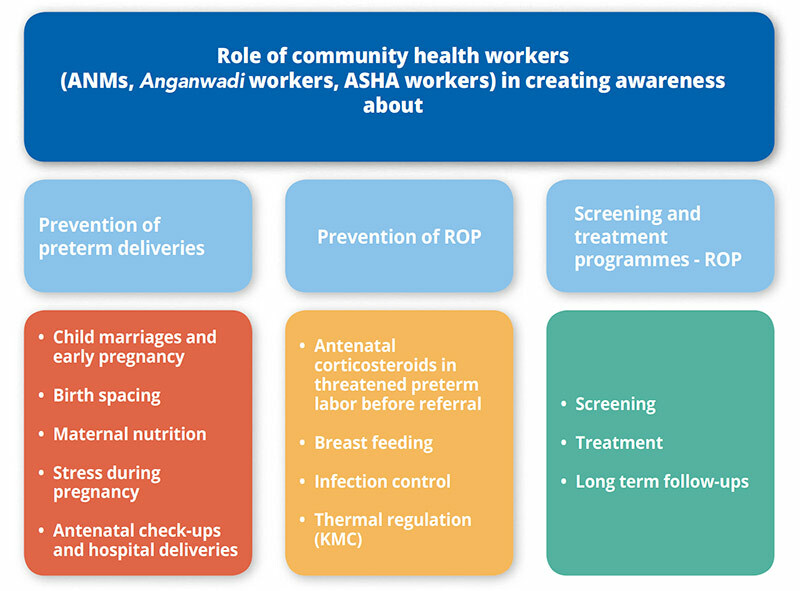 As ROP is a disease which requires multiple visits the ASHA workers can help in tracking pre-term infants in their communities and motivating parents to go for follow up visits. Educating parents about long term effects a pre-term birth can have on the eyes is also important, to encourage them to attend for follow= up. Simple language must be used in training the ASHA workers so they can effectively counsel parents. 1 Blencowe H,Lawn JE, Vazquez T,Fielder A, Gilbert C. Preterm-associated visual impairment and estimates of retinopathy of prematurity at regional and global levels for 2010. Pediatr Res. 2013;74:35-49. 3 Bhutta ZA, Ali S, Cousen S, Ali TM, Haider BA, Rizvi A, Okong P, Bhutta SZ, Black RE: Alma-Ata: Rebirth and Revision 6. Interventions to address maternal, newborn, and child survival: what difference can integrated primary health care strategies make? Lancet 2008,37(9642):972-989. 4 Mahavarkar SH, Madhu CK, Mule VD: A comparative study of teenage pregnancy. J Obstet. Gynaecol. 2008;28(6):604-607. 5 World Health Organisation: Report of a WHO technical consultation on birth spacing. Geneva:WHO;2005. 6 Barros FC,et al: Global report on preterm birth and stillbirth (3 of 7):evidence for effectiveness of interventions. BMC Pregnancy Childbirth. 2010 Feb 23;10 Suppl 1:S3. doi: 10.1186/1471-2393-10-S1-S3. 7 Mulder EJ, Robles de Medina PG, Huizink AC, Van den Bergh BR, Buitelaar JK, Visser GH. Prenatal maternal stress: Effect on pregnancy and the (unborn) child. Early Hum Dev 2002;70:3-14. 8 Adler J, Fink N, Bitzer J, Hosli I, Holzgreve W. Depression and anxiety during pregnancy: a risk factor for obstetric, fetal and neonatal outcome? A critical review of the literature. J.Matern Fetal Neonatal Med 2007;20:189-209. 9 Roberts D, Dalziel SR. Antenatal corticosteroids for accelerating fetal lung maturation for women at risk of preterm birth. Cochrane Database Syst Rev. 2006 Jul 19;(3):CD004454. 10 Lucas A, Morley R, Cole TJ. Randomised trial of early diet in preterm babies and later intelligence quotient. BMJ. 1998;317(7171):1481-1487.